Pumpkin Bars with Cream Cheese Frosting are perfect served as a dessert, a late night snack or just because. These lightly spiced, moist pumpkin bars are topped with a thick layer of old fashioned cream cheese frosting. Butter, eight ounce package of cream cheese and a sixteen ounce box of powdered sugar is transformed into a creamy and decadent cream cheese frosting!! These bars are so delicious, you don’t even need a plate. I have a confession to make, I’m not a huge fan of carrot cake but my hubby is. His favorite, all-thyme cake is carrot cake. More specifically “Mary’s Carrot Cake.” In fact, my sister Mary is famous for her carrot cake. When Mary comes to a party with her carrot cake in tow, the carrot cake fans come-a-running. Some day I’ll have to share her recipe. Until then, my hubby will just have to suffer and settle for a pumpkin bar. Poor baby! 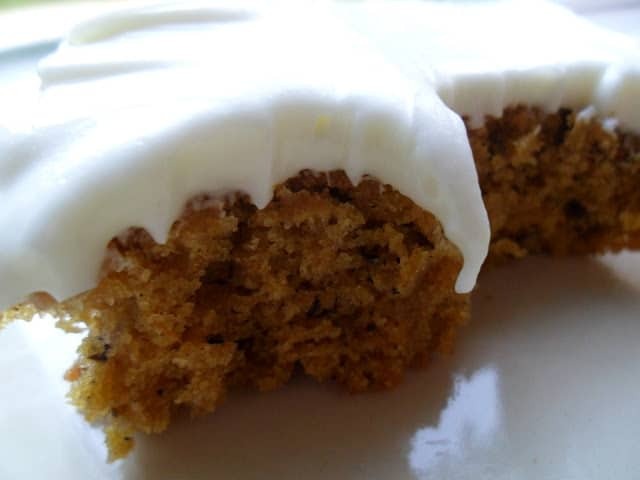 These yummy pumpkin bars stand in just fine for carrot cake. With a thick layer of cream cheese frosting, you might not be able to tell the difference between the two. I have a thing with cream cheese frosting, I love it! Cream cheese frosting would taste good on just about anything! I can’t think of one thing that wouldn’t benefit from a thick layer of cream cheese frosting. Can you? 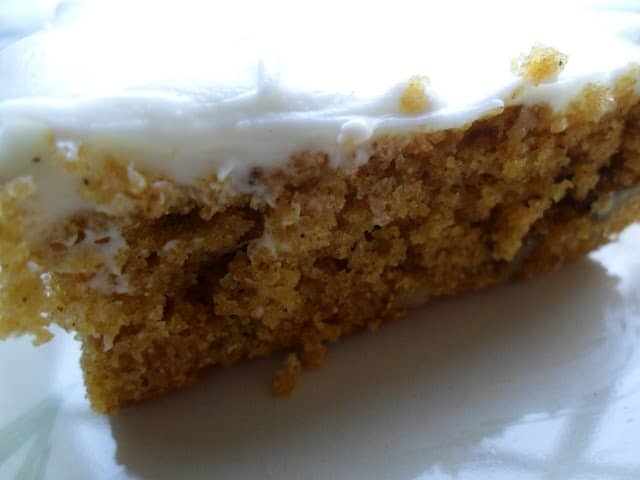 Pumpkin Bars are usually made in the fall but anytime is the right time for Pumpkin Bars. In a large mixing bowl, cream shortening and brown sugar. Add eggs, one at a time, beating well after each addition. Beat in pumpkin and vanilla. Combine the flour, cinnamon, baking powder, baking soda, salt, ginger, nutmeg, allspice and cloves. Add to creamed mixture and mix well. Stir in nuts. Spread into a greased 13 x 9 x 2 inch baking dish. Bake at 350º for 20 to 25 minutes or until toothpick inserted near middle comes out clean. For Frosting: Cream together cream cheese and butter. Add powdered sugar and vanilla extract. Beat until smooth. Spread on cooled bars.